NPF patient advocates meet lawmakers in Sacramento to work for change at the California Advocacy Summit. According to a recent study from Avalere, only one-third of enrollees in a 2015 health insurance plan on Healthcare.gov picked the same plan as the previous year. Furthermore, the majority of people in exchanges are enrolled in their plans for one year or less. With this high rate of health plan switching, it’s critical we work to provide continuity of care. This ensures that patients treating a chronic disease are not facing negative health outcomes due to these changes. 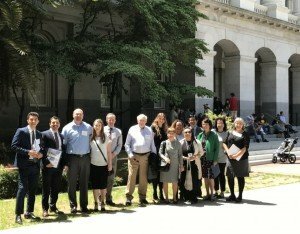 At our third annual California Advocacy summit, on May 8, 2017, the National Psoriasis Foundation (NPF), the Arthritis Foundation (AF) and the California Rheumatology Alliance (CRA) headed to California’s capitol building in Sacramento. Our goal was to raise awareness of this issue in the form of Assembly Bill 1353. AB 1353 ensures continuity of care for enrollees who are medically stable on a medication. Moreover, the provider will continue to prescribe the medication. These safeguards will provide patients with consistent access to coverage and care, even when they change their health plan. Establish reasonable and appropriate time-frames for a response by a health service plan. Provide an additional protection for patients suffering from life-threatening health conditions. Protect patients who are stable on their medications. Improve patient adherence to their medication schedule. Reduce adverse reactions from changes in the patent’s medication. Preserve the decision-making power of the patient-provider relationship. Reduce overall health care costs through improved medical adherence. At the California Advocacy Summit, nearly 50 patient advocates spent the morning learning about existing state laws and AB 1353. After lunch, advocates divided into nine groups to meet with various California representatives and senators. The aims of the meeting were to share personal stories, raise care awareness and identify potential co-sponsors for AB 1353. In less than four hours, advocates from NPF, AF and CRA had conversations with over 70 legislative offices. In addition to these meetings, advocates took to social media to share their experiences throughout the day. You can see these posts on Twitter, Facebook and Instagram by searching #CASummit17. AB 1353 is a two-year bill (meaning votes will not take place until the 2018 legislative sessions). However, advocates are looking forward to resuming their hard work next year. In the meantime, NPF continues to bring attention to this important issue. If you are interested in getting involved, please contact Amy Prentice, NPF’s State Government Relations Manager, at aprentice@psoriasis.org or 503-546-5551. You can also read more step therapy news and our blog.